All your favourite car brands were at this year’s Geneva Motor Show therefore we have decided to give you the low-down on all the astonishing revelations at the event in this one-stop overview. Scheduled for release in early 2017 and will be produced at Honda of the UK Manufacturing (HUM), this prototype made its global premiere at the 2016 Geneva Motor Show. The 10th generation Civic has many unique features including the sporty aesthetics and assertive stance with low, wide proportions. A longer wheelbase promises for a more dynamic driving experience whilst maximising the available interior space. Making its European debut at Geneva, Honda’s Clarity Fuel Cell is the world’s first production fuel cell saloon with best-in-class range of up-to 435 miles. This future-proof saloon houses the entire fuel cell powertrain under the bonnet which allows a spacious interior design with seating for five. Honda confirms the first European customer deliveries for the NSX will begin in 2016. A classic reborn, the NSX boasts features of the original blended into the sleek and modern surfacing. An all-new mid-mounted DOHC V6 engine has been developed with twin turbochargers and mated with a specifically designed nine-speed DCT. Geneva Motor Show was home to the debut of Nissan’s ‘Premium Concept’ crossovers which included special editions of their best-selling Qashqai and X-trail models. They showed how advanced materials can be used to create two premium crossovers that are both individually designed to appeal to a very different customer. IDS (Intelligent Driving System) represents Nissan’s vision for the future of electric vehicles and autonomous driving. The concept car contains highly evolved EV technology, advanced aerodynamic performance with exhilarating acceleration and sophisticated AI capability. They also revealed that a ‘Piloted Drive’ Qashqai will roll off production line in 2017. This will be Nissan’s first autonomous vehicle to be available in Europe with a plan to launch a range of cars with increasing autonomous capabilities by 2020. Peugeot has given their 2008 a bold SUV design, with power and appeal. This new model sports new technology including Grip Control, an enhanced traction control system making the 2008 suitable for any terrain. Mirror Screen is also included which uses MirrorLinkTM and Apple CarPlay technology enhancing Peugeot’s the i-Cockpit with added Active City Brake and Park Assist features that are rare in this segment. A world exclusive at the Geneva Motor Show, the Traveller is Peugeot’s entry into the Combi-space and VIP shuttle sector. The Traveller promises to give all its passengers a calm journey along with luxury comfort and ambience. A combination of the most efficient Euro6 BlueHDI engines and configurations up to 9 seats with a wide range of equipment makes the Traveller an incredibly adaptable vehicle. The Traveller i-LAB concept represents a vision of the future for business customer travel. On board the passengers experience an inspiring journey that is conducive for business. The 4 seats are arranged opposite one another, equipped with a 32inch tablet in the middle as well as WiFi, Bluetooth, induction charging docks and virtual reality headsets. Practicality is the Optima Sportswagon’s main goal which includes a series of highly ergonomic features in the boot. Its versatile 40:20:40 split-folding rear seats enable owners to slide any long equipment - such as skis - through the centre seat while two rear passengers can still sit in comfort. Pop-up sliding luggage rails, Smart Power Tailgate and a safety barrier net built into the back of the rear seats are other unique features. The Optima Sportswagon will be one of the first Kia model to feature Apple CarPlay (available by end of 2016) and Android Auto (available from launch) infotainment systems. Kia’s first plug-in Hybrid vehicle, this Optima will be going on sale across Europe in Q4 2016. Powered by a 9.8 kWh lithium-polymer battery pack paired with a 50 kW electric motor allows the Optima to travel on pure-electric for more than 33 miles at speeds as high as 75 mph. Targeted combined CO2 emissions of only 37g/km will ensure low running costs for private or fleet buyers. The all-new Kia Niro is a new low-emissions hybrid crossover, due to enter full series production in May 2016. It has been designed from a combination of significantly re-engineered existing Kia platforms to accommodate a Niro specific set of hybrid powertrain technologies. Kia’s 1.6-litre GDI engine is paired with a 32 kW electric motor and a 1.56 kWh lithium-ion polymer battery pack, giving the Niro ultra-low emissions of sub-89g/km and impressive fuel economy. Offering spacious and comfortable interiors as well as practicality and kerbside appeal make the Kia Niro stand out from the hybrid rivals. Named the first model to offer all three electrified powertrains, Hyundai introduced their all-new IONIQ Line-up which consists of the IONIQ Hybrid, IONIQ Electronic and IONIQ Plug-in. The aim is to make low- to zero- emission mobility accessible to everyone. The IONIQ Hybrid and IONIQ Plug-in both feature the new Kappa 1.6 GDI engine combined with a tailored direct responding, smooth shifting six-speed double clutch transmission. IONIQ Hybrid’s electric motor delivers 32 kW of power with a targeted combined CO2 emissions as low as 79g/km. While the IONIQ Plug-in will travel over 50 km on pure electric driving mode, combined with the 1.6 GDI will target CO2 emissions as low as 32 g/km. If you are looking for zero-emissions the IONIQ Electric will satisfy with pure e-mobility from a 28 kWh lithium-ion polymer battery and an estimated range of over 250 km. Celebrating its European premiere at the Geneva Motor Show is the new Genesis G90 large luxury sedan. The car features top of its class innovative technology including Advanced Smart Cruise Control and Lane Keeping Assistance systems created specifically for the Genesis G90. Inside, the first-class theme interior boasts VIP ergo passenger seats featuring multiple ranges of electronically-controlled adjustment. The G90 unfortunately won’t be available in the UK however a further five Genesis models will be launched over the next five years, so there is hope. An all-electric supercar, the DS E-Tense can silently produce 516Nm of torque, 402hp and zero emissions. Unique lines flow naturally around the body of the E-Tense portraying a sense of perpetual motion. Superior materials can be found inside, boasting a futuristic look with watchstrap design car seats and dashboard. The DS E-Tense evokes one simple desire, and that is to be driven. Named after the French pop group, Hyphen Hyphen, this bold concept took the Geneva Motor Show by storm. In partnership with the electronic pop group, Citroen has produced the Hyphen concept, which consists of a chunky exterior, two-tone paint scheme, extravagant interior with bright white, orange and green upholstery throughout. In partnership with surf brand Rip Curl, Citroen developed a special edition of their C4 Cactus which was revealed at the 2016 Geneva Motor Show. The car features Citroen’s Grip Control technology so owners can navigate through never-before-experienced driving conditions with ease. Front and rear protective skid plates offer complete protection no matter where you go. A panoramic glass roof allows the passengers to check if the weather is perfect for surfing - without having to leave the car. Toyota’s entry into the crossover market is represented by their new C-HR, bringing efficiency, low emissions and technology together with the latest generation 1.8-litre hybrid powertrain. This concept demonstrates the flexibility of Toyota’s New Global Architecture (TNGA) allowing for greater stylistic freedom and promoting engineering creativity to achieve more attractive designs and an enhanced driving experience. Ready for anything, the new Toyota Hilux is tougher, stronger and more capable off-road than ever before. Toyota have improved the torque delivery and fuel economy of their fitted 2.4-litre D-4D Global Diesel (GD) engine. This pick-up truly has the ability to tackle any terrain combined with style, comfort, safety and advanced technology to satisfy the business or leisure user. Toyota’s Proace Verso is a brand-new range of people carrier models. You can choose between three different models with three body lengths to suit your needs, from the Compact to the VIP version. Five diesel engines are available with varying outputs from 94 to 177bhp and targeted best-in-class CO2 emissions. Designed to comfortably accommodate a driver and up-to 9 passengers with their luggage, the Proace Verso will be a top contender in the future people carrier market. 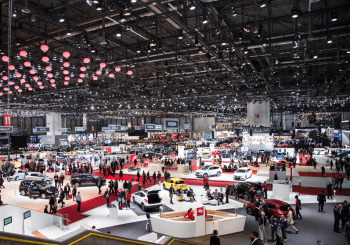 The 2015 Geneva Motor Show showcased a number of exciting motor industry news from various big car brands including, Toyota, Peugeot and Hyundai. Changes to the Toyota Auris revealed at the show are subtle but noticeable. Among the tweaked features are the headlights, taillights and both front and rear bumpers. Some small changes have also been made to the inside of the car, with updated connectivity equipment and a new instrument cluster installed. All together the upgrade shows a refreshed design with higher comfort and safety for passengers. With a top speed of 167mph and a 306bhp peak power output this is the most extreme Honda Type R model ever sold. The model is also equipped with 19-inch lightweight alloy wheels and 235/35 R19 tiers that have been developed especially for the Type R. The Civic has been dubbed as a racecar for the road and is rumored to be able to go from 0 to 62 mph in just 5.7 seconds! The show was a debut for the Peugeot 208s facelift. There were a number of exciting changes to the model, including a sharper front bumper, separate fog lamps, a wider grille, deeper chrome finishes and additional safety features. The Mountain Vibe MPV is ideal for off road roaming thanks to its Grip Control traction management, which allows it to navigate mud, snow or sand. This makes the model an ideal option for all those seeking a bit of adventure. It was certainly an attention grabbing vehicle at the show, with pink fog light surrounds, mountain green bodywork and black roof rails, Citroen have taken a risk that’s paid off. The Mountain Vibe comes equip with an all the vital accessories for a true adventurer. The Kia Cee’s GT Line is defiantly one to watch out for. Running off a 1.0 litre turbocharged gasoline three-cylinder burner, the vehicle has ice cube LED daytime running lights, specific upholsteries, aluminium pedals, a new start/stop button, chrome trim and 17-inch alloy wheels. The changes made to the Hyundai i40 include visual tweaks, improved safety features and upgraded engine systems. The interior of the vehicle is made with higher-grade materials than previous models, while the changes to the outside include the privacy glass, new front and rear lights and 16-inch and 18-inch alloy wheels. Did you have a favourite model at the Geneva Motor Show? Share it with us on Facebook or Twitter!